Bullet HD was founded in 2008 as one of the first manufacturers of action-sports cameras. As a motorcycle enthusiast and Harley Davidson fanatic, the founder tried every action camera on the market, but found them unfulfilling as a motorcyclist. Biker Pro and Biker Mate bring to the table features that are unique to the needs of bikers. A motorcycle is the ultimate symbol of freedom, and your action camera should reflect that ethos. Bullet HD aims at providing state of the art bike cameras for motorcycle photmotorcycle-video-camera-aboutus-2ography amateurs and pros alike. With a wide range of cameras, the company offers to broaden the horizons of creativity for the user. The camera range includes Jet S, Biker Mate, Biker Pro, Pro Wi-Fi, and Pro 4 with unique features and accessories that make motorcycle photography a stress-free and enjoyable job. The cameras come loaded with an upgraded Wi-Fi module, and water resistant properties that make shooting at hard locales such as rugged terrain or busy markets remarkably easier. The philosophy behind the creation of the company and the product design is to keep motorcyclists’ interest levels at peak during a shoot. 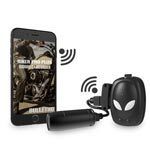 Now with the free apps, the user can download a companion app for the corresponding BulletHD action camera from the iTunes App Store or Google Play and control the camera wirelessly via the camera’s Wi-Fi. Adjusting the camera settings, viewing and managing recorded media, and sharing the adventures to the social media channels is all possible from the BulletHD App. Bullet HD cameras come with precise accessories so that getting a perfect shot is possible under any circumstances. From spare batteries to extra housings and mounts, Bullet HD is home to all the accessories required to make the most out of their cameras in order to give the user an impressive experience.